***Disclosure-Sample copy received for review. All opinions stated are based on our own personal experience. Are you headed out of town this Memorial weekend? How do you keep your kids busy in the car? One thing that works for us is watching movies on the DVD player. What is in our DVD player?...the Autobots’ best rescue team­­- CHASE, HEATWAVE, BLADES and BOULDER. 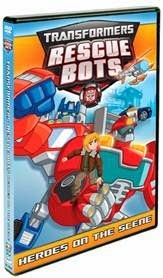 In this collection, the Rescue Bots go undercover to protect the quiet little town of Griffin Rock from the green ooze known as the Squilsh, recover treasure stolen by pirates and help Griffin Rock recover from an earthquake! Along with their human friends, the Burns family, the RESCUE BOTS help keep people safe, and along the way they learn what it really means to be a hero! We all like Transformers. My kids like to watch the rescue bots go on their adventures and it keeps them from asking "mami, are we there yet?" Recommend for the entire family.